Alcatraz Island is a small island developed with facilities for a lighthouse, a military fortification, a military prison (1868), and a federal prison from 1934 until 1963. During the 29 years it was in use, the jail held some of the most notorious criminals in American history and the penitentiary claimed that no prisoner successfully escaped. 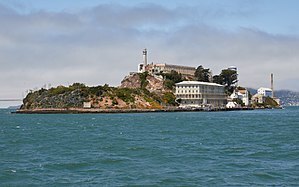 This article uses material from the Wikipedia article "Alcatraz Island", which is released under the Creative Commons Attribution-Share-Alike 3.0 License.